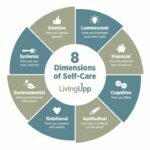 Living Upp’s 8-Dimensional system, which was developed to help you create, implement, and maintain supportive self-care strategies that help you get and stay organized so you can focus on your highest priorities. In the midst of a big life transition? Rebuilding after an unexpected change in life circumstances? Transitioning to a new chapter of life? Navigating an unexpected decline in your health? Realizing that it’s time to do life differently? Life’s heavy moments often come when we least expect them, which is why having a solid self-care practice is so essential.